I've been writing "doomsday debunking" articles here for a while now, and was surprised to find that some people are terrified by these stories, occasionally suicidal, with hundreds of comments by scared people on my posts here. To help raise awareness of this issue, I've made a petition: "To: Journalists and lawmakers: Let's End Dramatized Reporting of "Doomsday" Stories - The Vulnerable Get Suicidal". The petition's video is by David Morrison (distinguished former NASA astrobiologist, expert on meteorite impacts and former head of the Sagan institute) talking about cosmophobia, from 2012. Journalists should not dramatize "doomsday stories" beyond what the sources say. If they must run them (as they had to for 2012 of course), they should also indicate clearly if there is no scientific support. This petition was prompted by a story that got widespread coverage during the "silly season" here in the UK. It promoted a non noteworthy video on youtube, with amateur graphics of "the earth reeling like a drunkard" along with other events of the Apocalypse with the title "Why The World Will End Surely on 29th July 2016 ? Shocking Facts". Journalist should not publish totally non noteworthy "silly season" doomsday stories at all - in view of the risk of causing extreme anxiety and possibly suicides for vulnerable people. If you agree with these two points, please sign the petition. Also do share it with your friends. So far I'm doing this petition mainly to spread awareness of the issue. I welcome suggestions of appropriate decision makers to send it to! I don't think realistically we can end all dramatized reporting of "Doomsday". But I do think it is feasible to do something about the mainstream journalism reporting, by increasing awareness, if in no other way. That's the aim of this petition. I am an author of online articles debunking Nibiru and other non scientific apocalyptic news stories. I got many pm's and comments from anxious vulnerable people after the Telegraph article, who thought we were all going to die when the timer reached zero some time on July 29th. The NASA scientist David Morrison, who fielded "Ask an astrobiologist" up to his retirement in 2012 coined the word "cosmophobia" for people who suffer extreme anxiety as a result of stories like this. The messages I get via pm are similar. Including questions about when it would happen in their time zone. Incidentally, if anyone reading this is scared, please see that first article, where I explain with simple arguments why none of those things are possible. If you have questions, just comment on the article and I'll reply to you as soon as I can (usually within 24 hours). Some of them get so anxious they can't sleep, and worry about such things day and night. They try to calm down but when they go online they see yet another story or video about a near future Doomsday and start panicking again. Some have to leave their jobs because of anxiety, and others are suicidal. There is at least one confirmed suicide caused by the 2012 scare and David Morrison says that anecdotally he was told of several more. Now that that's over, I'm already getting messages about separate upcoming "predictions" for each of August, September and October of this year. The video for the Telegraph article was not uploaded by anyone of note. Indeed it was an unauthorized copy denounced by the original author in a post to their facebook page. The video itself doesn't mention the date of 29th July either. Someone just reuploaded this video and added the 29th July date to its title. AFAIK this title was the Telegraph's only source for the end date for their count down timer. Other papers that ran this story, using the same date, though without the drama of a count down timer, included the Independent, the Mirror, and Metro magazine (who published the denouncement of the video by John Preacher). (wikipedia entries about the Independent, Mirror, Metro). The Telegraph removed the timer from the page when it reached zero. This video (which I won't link to here, easy to find) has racked up over six million views as a result of all this free publicity and it runs ads so has probably earned its unauthorized uploader of the order of $8,000 to $22,000 in youtube ads revenue. They have now changed the video title to "Why The World Will End Surely on 31st October 2016 ? Shocking Facts", presumably in hope of some more free publicity of the same sort in October. They have also disabled comments. I hope that some of the journalists who publicized this 29th July story, if they read this, will have second thoughts about running similar stories in the future, scaring vulnerable people and putting money into the pockets of unprincipled internet hoaxers. This is on the basis of messages I get, some of the things that scare people. Perhaps some of these might surprise you if you are a journalist. Use of dramatic hyperbole again with any of those words. Example, "Britons 'thinking Brexit would lead to APOCALYPSE' stocking up on doomsday supplies" Though it's a perfectly acceptable figure of speech, readers with cosmophobia will understand this word literally as their default assumption for what you mean. It needs a little care. and especially so if the context is astronomy or cosmology. Dramatic fake descriptions - like the Telegraph fake tweets. Though it may seem ridiculously over the top to a journalist, this humour is much harder to spot for these easily scared people. Exaggerated images. Many stories about asteroids picture Don Davis's artist's impression of a planetoid hitting the early Earth in a story about a rock of a few hundred meters up to 10 kms or so in diameter. That's just by way of examples. Basically it's natural to exaggerate with visual or verbal hyperbole. But when you find yourself about to write something that makes the story sound excessively scary over and above the facts, whatever they might be, do bear in mind that your story will be read by vulnerable easily scared people such as the ones David Morrison describes. It’s actually a fuzzed out version of this image of Cassiopeia A, a supernova remnant 11,000 light years away by the Chandra X Ray observatory. Nothing at all to do with Earth or our solar system! 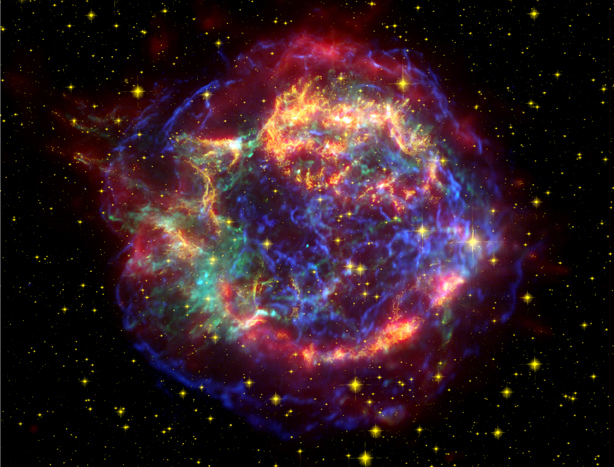 The fuzzed out image of Cassiopeia A was originally used as a cover image for stories about the "Big rip" theory. The only connection with the big rip theory is that the research for it involved study of the red shifts of distant supernovae. which in this article is used to illustrate a story about the estimated 450 meters diameter 2013 TV135. It's actually an artist's concept for the giant impact hypothesis theory of the formation of the Moon as a result of a Mars sized object called "Theia" hitting the proto Earth. As well as not running such stories, there is also a need for more debunking to counteract all this publicity in the papers. There are many excellent debunking articles and videos from 2012 by Phil Plait (of "Bad Astronomy" fame), David Morrison (now retired, senior NASA astrobiologist and expert on asteroid impacts and former head of the Sagan institute) , and several others - but I get scared people asking me, who is debunking these stories now? Of course, the 2012 debunking articles are still valid, and changing the date makes no difference. The ideas are as nonsensical in 2016 as they were in 2012. But some readers of news stories will feel they can't evaluate any astronomical and geometrical ideas for themselves. They are impressed by the large number of recent media stories promoting these various doomsday ideas, and an almost complete lack of any stories debunking them, which creates the very false impression that the majority opinion is that these stories are true. If you don't have a strong scientific background, any astronomer can help you write it. These debunking articles can also be entertaining and engaging as I hope I've shown with my own articles. I've listed links to some of my own articles and answers debunking various "Doomsday" scenarios that I've been asked questions about over the last year here: Debunking “Doomsday” - Nibiru, Pole Shift, California falling into the sea, Supervolcanoes, black holes, … - idea for new online / kindle book. There's probably not much we can do about youtube uploaders making videos about "Doomsday" in order to make money from them. Similarly also for "Before it's News" - those are covered by right for free speech I'd imagine. But I think there is some hope of doing something about the articles that run in responsible mainstream newspapers, online or in print, like the Telegraph, Independent, etc. If it gets to some high number like several thousand signatures, I might send it to editors of newspapers as a starting point? I think a lot of the problem here is that they are not aware of quite what an impact their articles have on vulnerable people. SO YOU WANT TO SIGN IT? "To: Journalists and lawmakers: Let's End Dramatized Reporting of "Doomsday" Stories - The Vulnerable Get Suicidal". Also do share the petition with others who you think may be interested.